TOKYO (Reuters) - Ousted Nissan Motor Co Ltd Chairman Carlos Ghosn was indicted on two additional charges of financial misconduct on Friday, bringing the number of charges against him to three. Ghosn, credited for spearheading Nissan's financial turnaround two decades ago, has already been charged for under-reporting his income. Hours before, police arrest Nissan board member Greg Kelly, a key ally to Ghosn, en route to Yokohama, where Nissan's headquarters are located, following his arrival at an airport outside Tokyo. Renault SA, which owns a controlling stake in Nissan and where Ghosn serves as CEO and chairman, taps Thierry Bollore to serve as interim CEO in Ghosn's absence, stopping short of dismissing Ghosn and creating a standoff with Nissan. Tokyo authorities extend Ghosn's detention for an additional 10 days. Prosecutors decline to comment on the extension. 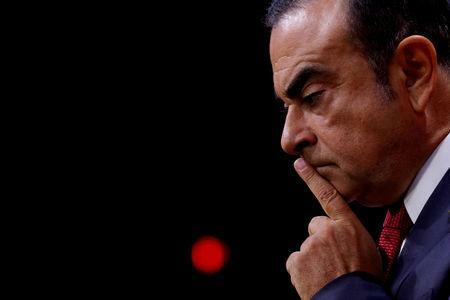 Ghosn and Kelly, along with Nissan, are formally charged for under-reporting Ghosn's income over five years to 2015. Ghosn and Kelly are rearrested on allegations of understating Ghosn's income for three more years through March 2018. Renault says its own audit of Ghosn's salary has so far has found no irregularities. A Tokyo court extends Ghosn's detention by 10 days. At the hearing, a judge says Ghosn's continued detention is necessary due to flight risk and the possibility he could conceal evidence. A second request to end Ghosn's detention is rejected. Ghosn is formally charged with aggravated breach of trust, and of under-reporting his income over three years to 2018. Nissan is also indicted on the latter charge.